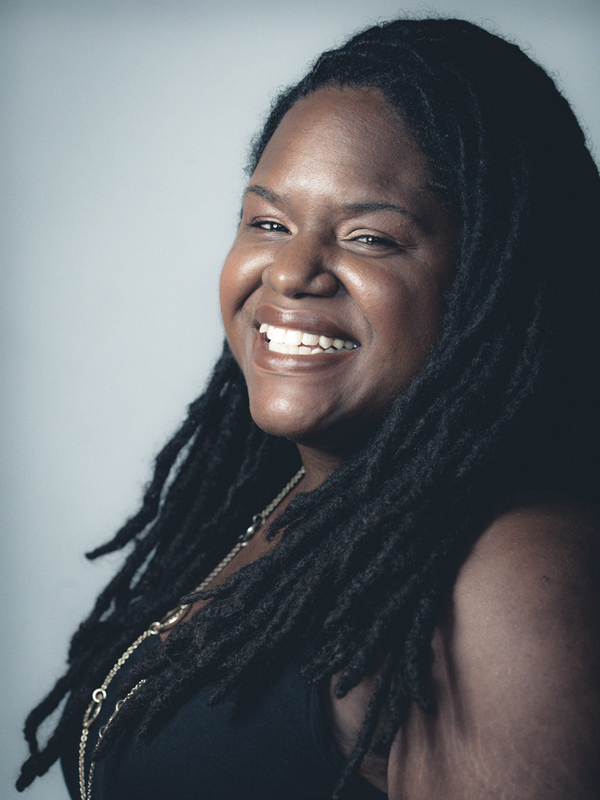 DéLana R.A. Dameron is the author of Weary Kingdom (University of South Carolina Press, 2017), which is part of the University of South Carolina Press’s Palmetto Poetry Series, edited by Nikky Finney. Her debut collection, How God Ends Us (University of South Carolina Press, 2009), was selected by Elizabeth Alexander for the 2008 South Carolina Poetry Book Prize. 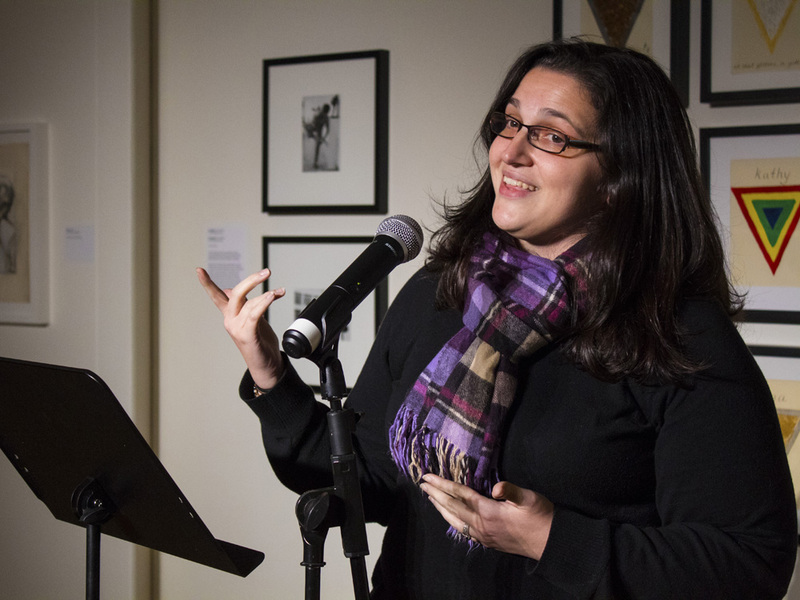 Dameron holds an MFA in poetry from New York University where she was a Goldwater Hospital Writing Workshop Fellow. 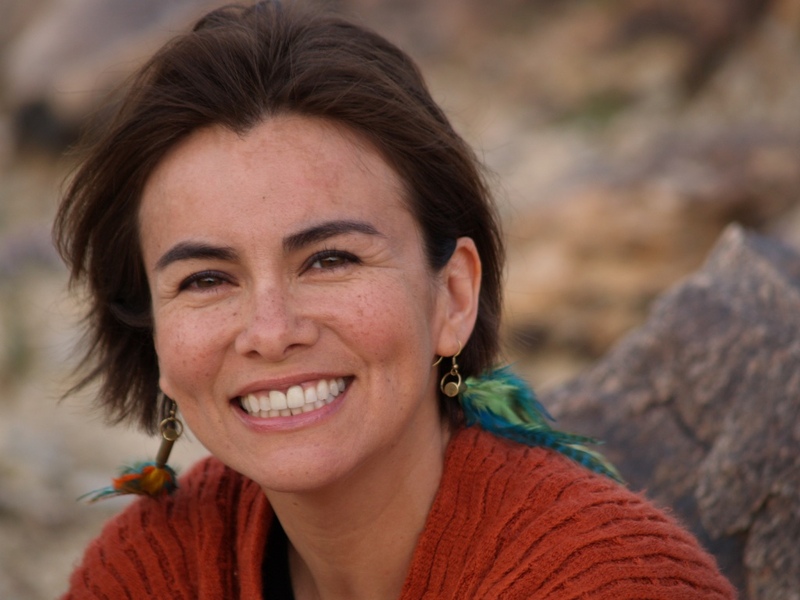 She has conducted readings, workshops, and lectures all across the United States, Central America, and Europe. 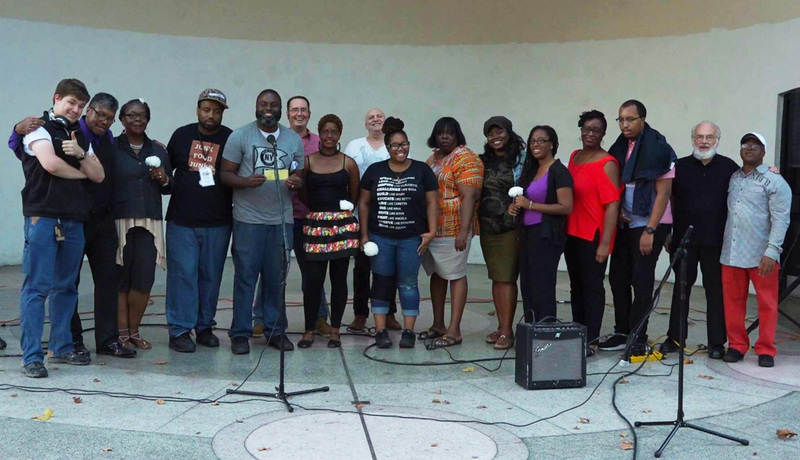 I have been an alumna of the Cave Canem summer retreat since 2008, and had the opportunity to participate in smaller New York City workshops in 2008 and 2009. While the summer retreat is life-changing and affirming, and provided me with a long roster of lifelong friends in the poetry world, the prolonged space(s) with Myronn Hardy and Tracy K. Smith as facilitators provided me with a framework of what a community workshop could look like, how to be rigorous readers and writers in an after-work, weekly setting, while also building community. Cave Canem, for me, is about building a community of people who will sharpen your poeming pen. I did all of this before I entered an “official” MFA workshop table at New York University. I say that to say, when I exited the MFA workshop table, I did not choose a life of teaching poetry in academia (though I would love to teach a class here or there! ), but found other ways to pay my bills, and searched for opportunities to teach workshops to folks who went to work from 9:00 AM until 6:00 PM and came and sat down and still endeavored to read and write poetry in a supportive and educational space. When Cave Canem asked me to teach the Poetry Conversations workshop, billed especially for beginning and intermediate poets, I jumped at the opportunity and said yes. Here, I was able to come home, to open up space for the many levels of poets that would hopefully sign up for the course. It became very clear to me that I wanted to teach what I live: writing the everyday/the landscape(s) I inhabit into poetry, making it sing. The “A Street in Brooklyn: Writing Into the Urban Landscape” workshop was at once a survey of Gwendolyn Brooks’s work as a poet. Weekly we read chronological selections from A Street in Bronzeville (Harper, 1945), Annie Allen (Harper, 1949), The Bean Eaters (Harper, 1960), In the Mecca (Harper, 1968), and single poems from her collected works in Blacks (David Co., 1987). Reading Brooks is not only an exercise in understanding the mastery of writing the ordinary (Black folks in Chicago, the urban landscape writ large, etc.) into extraordinary poetry, but quickly I found that to teach Brooks over the span of her career, as documented in Blacks, is to also teach a Black history course, a Chicago history course. Then, to charge the poets to do as Brooks did, and look out of their own windows for the poetry of their everyday lives, they included their own poetic historical markers of where and who they are now, especially in the context of gentrification, “urban renewal,” and the general displacement of Black cultural markers, people, histories, and stories. At the last class there was an overwhelming sadness, but also a triumph. We had been through a literal journey together. At my urging, I asked poets to write about their neighborhood, a place that no longer existed, a place that showed NYC Black History—a mural, a statue, a hanging tree—and to write those things into sonnets, in rhyme, as ballads, as Brooks did in her early years. Together we coined the term “Brooksonian” and looked for moments when she shined the best, and then applied it to our poems that we brought to the table for workshop. As the weeks progressed, and we marched along the historical timeline from 1945 (A Street in Bronzeville) to 1968 (In the Mecca) and beyond, we watched Brooks’s work open up, and we talked about what it meant to be a poet moved by a historic moment, and what it meant for Brooks to break open, even more, the poetic form. We talked about the uses of poetry, the politics of it, the immediacy and need. That same day a participant brought in a poem that referenced, as Brooks might have (and did for her Chicago Black people), Eleanor Bumpers, who was shot and killed by police in 1984 in the Bronx, as well as the now no longer existing Slave #1 Theater in Bedford-Stuyvesant, Brooklyn, and all I could do was shake my head in awe: We had arrived. Photo: (top) DéLana R.A. Dameron (Credit: Rachel Eliza Griffiths). (bottom) Workshop participants (Credit: DéLana R.A. Dameron). 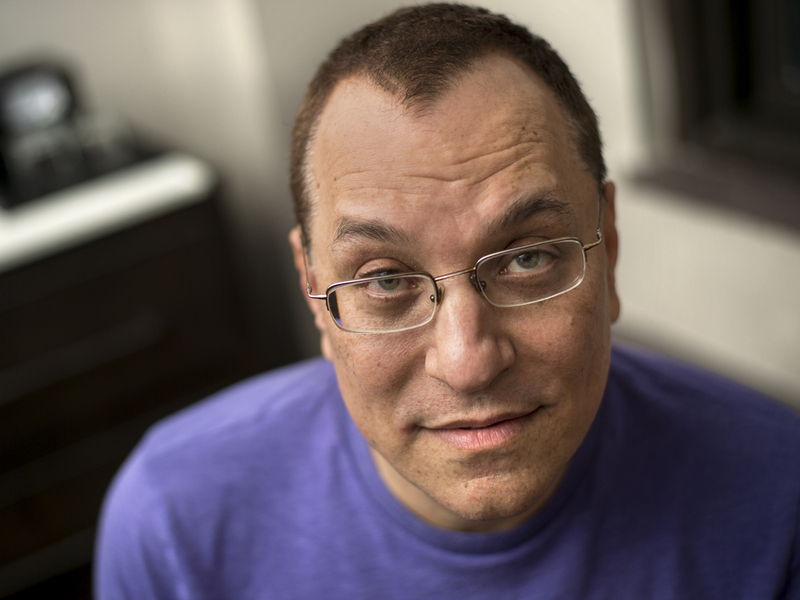 Kenny Fries is the author most recently of In the Province of the Gods (University of Wisconsin Press, 2017), which received the Creative Capital literature grant. His other memoirs include The History of My Shoes and the Evolution of Darwin’s Theory and Body, Remember: A Memoir. His books of poems include In the Gardens of Japan, Desert Walking, and Anesthesia. He is the editor of Staring Back: The Disability Experience From the Inside Out, and was a Creative Arts Fellow of the Japan/U.S. Friendship Commission and the National Endowment for the Arts, and twice a Fulbright Scholar (Japan and Germany). Fries teaches in the MFA Creative Writing Program at Goddard College. For those of us who live with disabilities, when we think of access we mostly think of physical access: ramps, lifts, and technological aides. But cultural access is just as essential as physical access to an inclusive society. Cultural access is a two-way street. People with disabilities need to see themselves represented—not stereotypically and as fully human—in our culture. But disabled and nondisabled alike benefit from access to disability culture because the experience enriches all of us. I recently completed a fifteen-city tour for In the Province of the Gods, a memoir about my time as a disabled foreigner in Japan. Immersing myself in Japanese culture and meeting with artists, disability studies scholars, and atomic bomb survivors, while at the same time coming to terms with my HIV diagnosis, I learn about how Japan views impermanence and mortality. 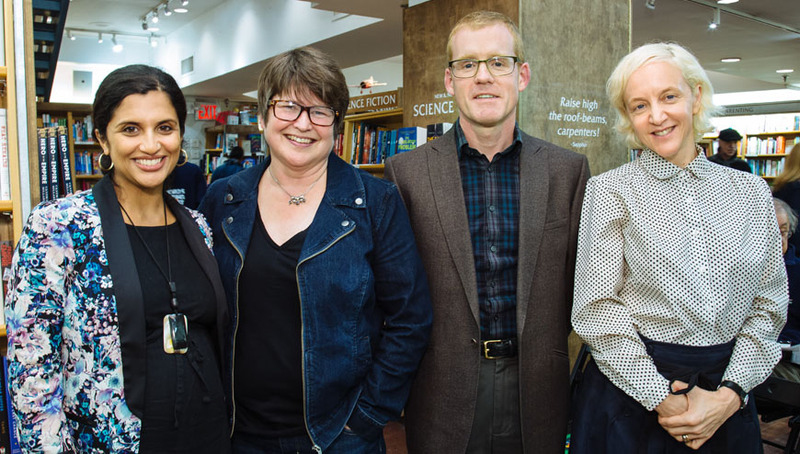 Poets & Writers’ Readings & Workshops program supported three tour events that increased access to disability culture. I read and was in conversation with writer Susan R. Nussbaum at Access Living of Metropolitan Chicago, which is committed to making our society more inclusive of people with disabilities by “removing barriers so people with disabilities can live the future they envision.” Access Living’s Disability Arts & Culture Project is exemplary of the centrality of disability arts and culture to such inclusion. 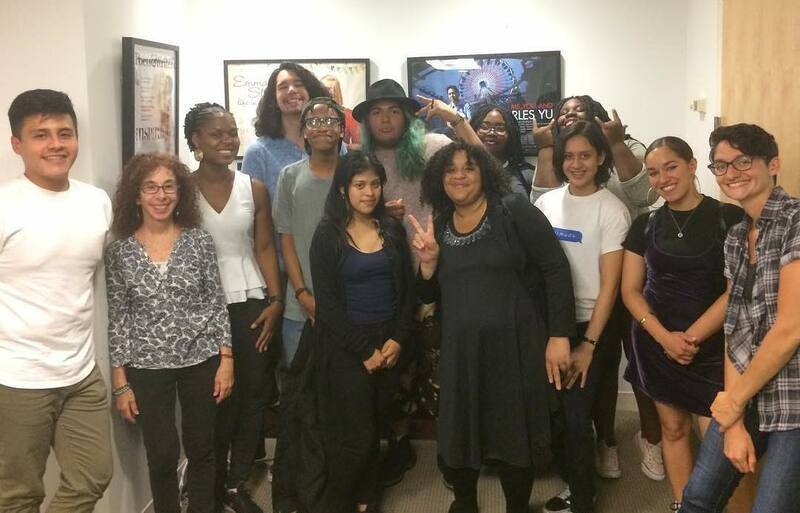 The audience at Access Living included people with disabilities of different ethnicities and sexualities, Chicago-based artists, as well as students from the Program on Disability Art, Culture, and Humanities at the University of Illinois, Chicago. A wide-ranging discussion about my writing process for In the Province of the Gods; my intersecting identities of being disabled, gay, and Jewish; and what it means to be considered “other” both in Japan and the United States ended the evening. I read at the University of Houston’s Medicine and the Arts Series, part of the Honors College’s Medicine & Society Program, which gives pre-health professionals, other students, and the public an opportunity to connect the arts to “the meanings of illness and caregiving.” Programs in narrative medicine and medical humanities are growing across the United States, and it is important that the stories of and by people with disabilities are included to counteract the dominant medical model of disability, which is predicated on eradicating disability either by killing it or curing it. One of the highlights was visiting their Literature and Medicine class, where a student shared his e-mail dialogue with a Buddhist professor about my book’s relationship to the process of shedding the self. The dialogues in Chicago, Washington D.C., and Houston are examples of what historian Paul K. Longmore calls our quest for “collective identity.” Longmore writes, “whereas the society-at-large prizes self-sufficiency, independence, functional separateness, and physical autonomy, the disability experience puts forth the values of self-determination, interdependence, personal connection, and human community.” On a month-long book tour, these events stood out as they not only increased access to disability culture, but also the importance of such values during the turbulent times in which we live. 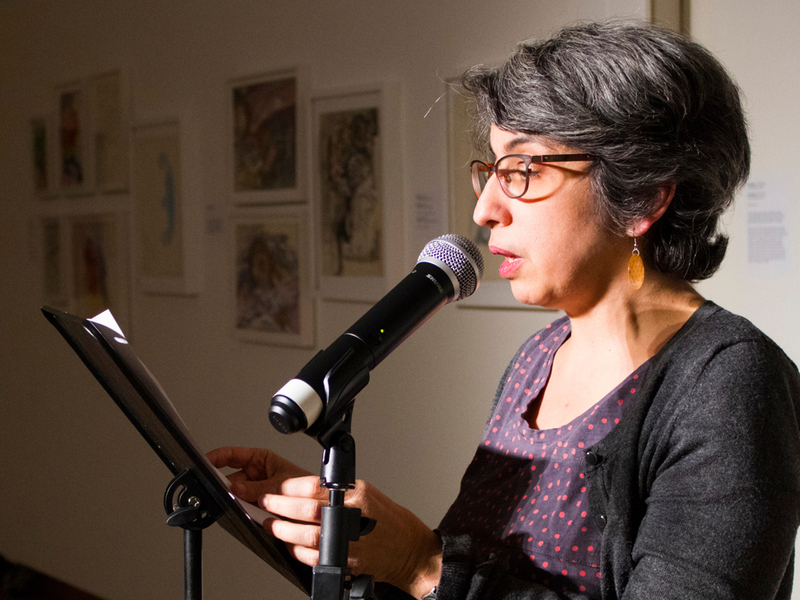 Support for Readings & Workshops in Chicago, Houston, and Washington D.C. is provided by an endowment established with generous contributions from the Poets & Writers Board of Directors, and others. Additional support comes from the Friends of Poets & Writers. Photos: (top) Kenny Fries (Credit: Micheal R. Dekker). 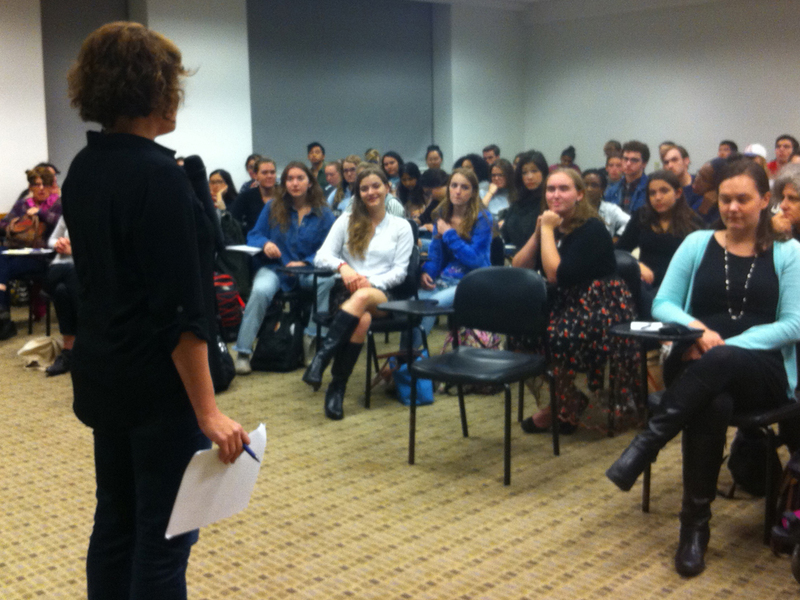 (bottom) Libbie Rifkin, Teaching Professor at Georgetown University, and audience (Credit: Kenny Fries). 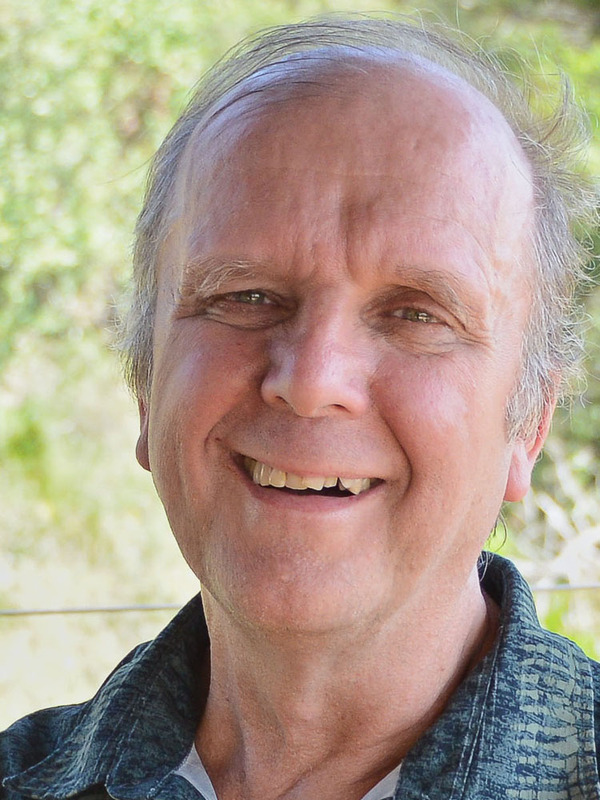 John Fox is the author of Poetic Medicine: The Healing Art of Poem-Making (TarcherPerigee, 1997) and Finding What You Didn’t Lose: Expressing Your Truth and Creativity Through Poem-Making (TarcherPerigee, 1995), and his work is featured in the PBS documentary Healing Words: Poetry and Medicine. In 2005, he founded the Institute for Poetic Medicine and his chapbook, The Only Gift to Bring (Seasonings Press, 2015), is available through the institute. 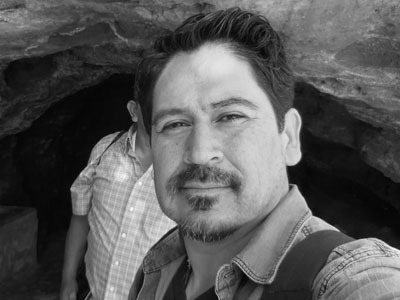 Fox blogs about his experience leading writing workshops for Project Avary, an organization in San Rafael, California offering long-term support, resources, guidance, and training for children with incarcerated parents. In the spring of 2016, Zach Whelan of Project Avary called the office of the Institute for Poetic Medicine to ask if I was available to bring poetry to the teens they served. This residency would occur during a mid-June, two-week summer camp. Zach and I spoke for over an hour. I was impressed with three things: 1. The seasoned care the Project Avary staff holds for teens with a parent or parents in prison. 2. The solid and proven program Project Avary has built, which includes a commitment of ten years to a child from the age of eight through their teen years. 3. Zach’s openness to not only poetry writing, but my focus on poetry-as-healer. By the end of our talk and in subsequent meetings, we agreed to collaborate in an ongoing, mutual process that would bring poetry into the lives of Avary participants. I would learn about the acute challenges faced by these teens—their sense of loss and abandonment, the societal stigma attached to having a parent in prison, as well as their capacity for resilience and how much they could teach us. I needed to learn and understand that reality to better know what my optimum role could be in joining this team. This process helped me in the selection of relevant poems that could serve as catalysts for writing. In turn, Avary would learn from me how poetry can make a direct impact on the teens and their ability to dive into their issues of concern. Through the durable capacity of a poem, using the tools of poem-making, and by the natural strength of a supportive community, we could create a safe and generative way to explore and express. This mutual, encompassing collaboration becomes particularly important because the time to nurture and tend to their creative voices does not end with our limited time together—it actually begins! What I can report to you is that Project Avary has incorporated poetry writing workshops into the core of their curriculum. The conclusion of my two-year summer camp residency (with forty new campers joining each year) included a two-hour evening program where all participants shared their poems (also songs, skits, magic tricks, etc.) with the entire community. 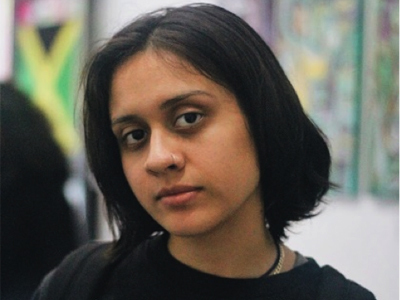 Avary calls this “The Untalent Show” with the emphasis on making it an open invitation to everyone—especially those who might feel they have nothing worthy to offer. When a poem was read, there was a palpable quieting of a mostly young and happily raucous group at summer camp, which included dozens of young counselors and other staff. The people listening were less “audience” and more like family member, sensitive to their brothers and sisters, and cheering them on. But what about the poetry? With their permission, I’m able to share some of the poetry by these young Project Avary participants. Love is like dead tissue that won’t fall off. What was the point of Love. Did i want Love, did i need Love. Would love make me happy. The truth was i wanted love. But would love want me. She was pure in a world not ready for her. A rose born without thorns. A body of water with no ripples. A mirror with no cracks. She was content in every sense of the word. of keeping her that way. Support for this event was provided, in part, by Poets & Writers, thanks to a gift from Diana Raab. 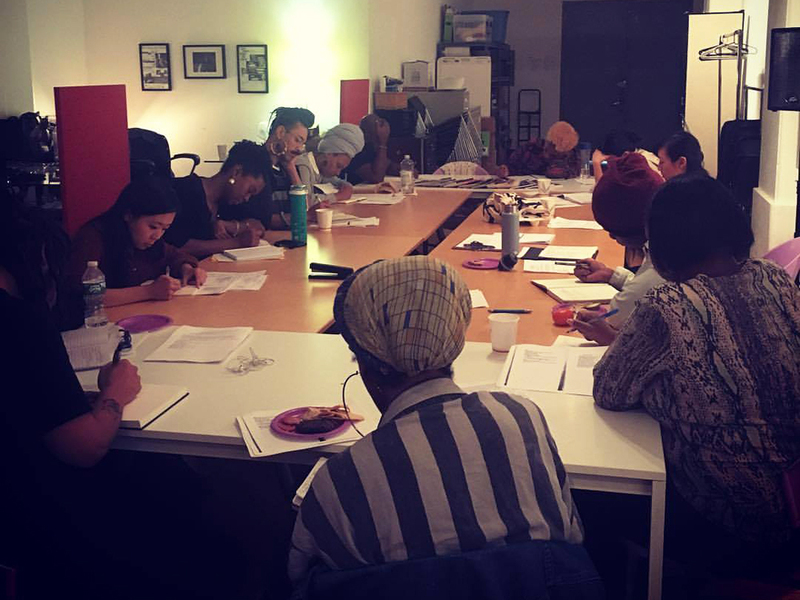 Additional support for Readings & Workshops in California is provided by the California Arts Council, a state agency, the National Endowment for the Arts, a federal agency, and by the Friends of Poets & Writers. Photo: John Fox (Credit: Valerie Knight). Jill Kalotay has been supporting the Spencertown Academy Arts Center as a volunteer for the past ten years. 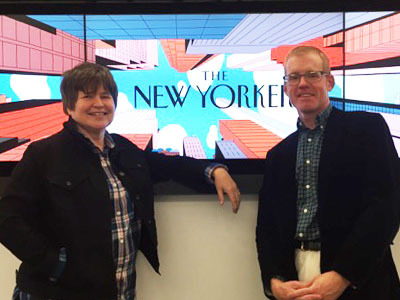 In 2015 she accepted the position of cochair of the Festival of Books with David Highfill, an executive editor at William Morrow, and she joined the Spencertown Academy Board of Directors in 2016. It is important to me to support the arts, and particularly authors, since my daughter Daphne announced at the age of three that she wanted to be a writer. 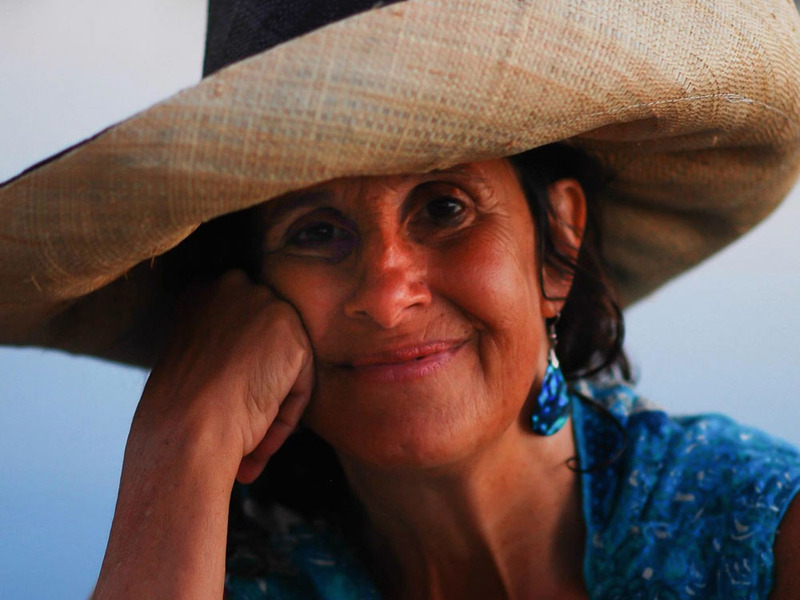 She has shown me what hard work it is, and how steep the climb to success is in today’s market. The annual Festival of Books, presented by the Spencertown Academy Arts Center, is a way to feature writers and focus on books—and to help ensure that they will be here for some time to come. Housed in a beautifully restored 1840s Greek Revival schoolhouse at 790 State Route 203 in Spencertown, New York, the Spencertown Academy Arts Center is a cultural center serving Columbia County, the Berkshires, and the Capital region. It offers a variety of free and low-cost community arts events, including concerts, readings, theater pieces, art exhibitions, and arts-related workshops and classes. The three-day event takes place over Labor Day weekend, and also features a huge book sale, with over ten thousand donated books on offer. “The best books sale in the area,” according to many visitors. All the books are culled, cleaned, and sorted by Academy volunteers—those book lovers who want to get as many books as possible out into the world and bring in money for the Academy so that we can keep our doors open for one more year. Typically all of the authors come without promise of remuneration. 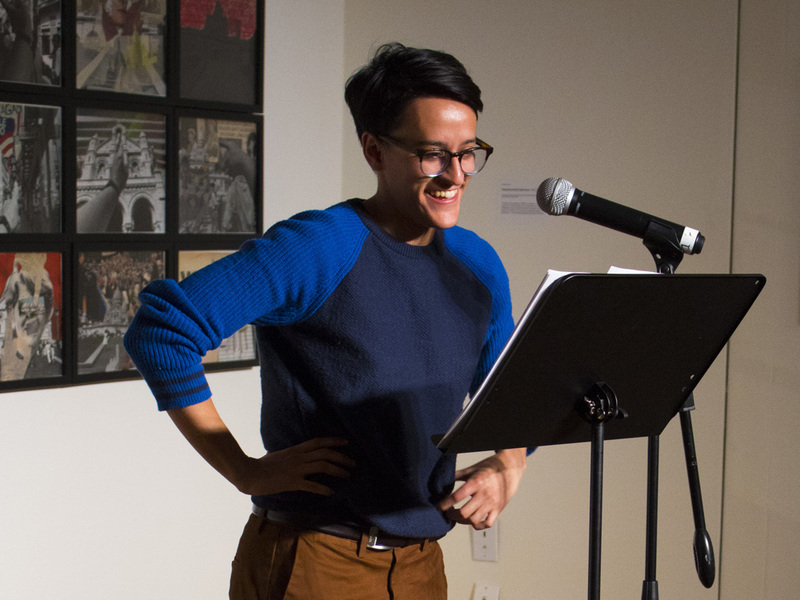 This year, we hosted an amazing array of artists, and five fiction writers were generously supported by grants from the Poets & Writers’ Readings & Workshops program. Wesley Brown read from his Dance of the Infidels, a collection of related stories about jazz musicians (mostly real) and jazz lovers (imagined) in 1930s and 1940s New York City jazz clubs. Rebecca Morgan Frank read from her collection, The Spokes of Venus, and spoke about the inspiration for her poems, in which magicians, wig makers, sculptors, perfumers, and choreographers help conjure these works about making and observing art. In spite of the incessant rain beating on our tent, on one of the worst days of the summer, Elinor Lipman and Louie Cronin shared the stage for a session called “If These Walls Could Talk.” Lipman’s latest book, On Turpentine Lane, is a romantic comedy about a restless woman who impulsively buys a dilapidated house that soon reveals a mysterious past. Everyone Loves You Back, Cronin’s very funny first novel, features another house in dire need of repair, this one in Cambridge. Town and gown meet again! 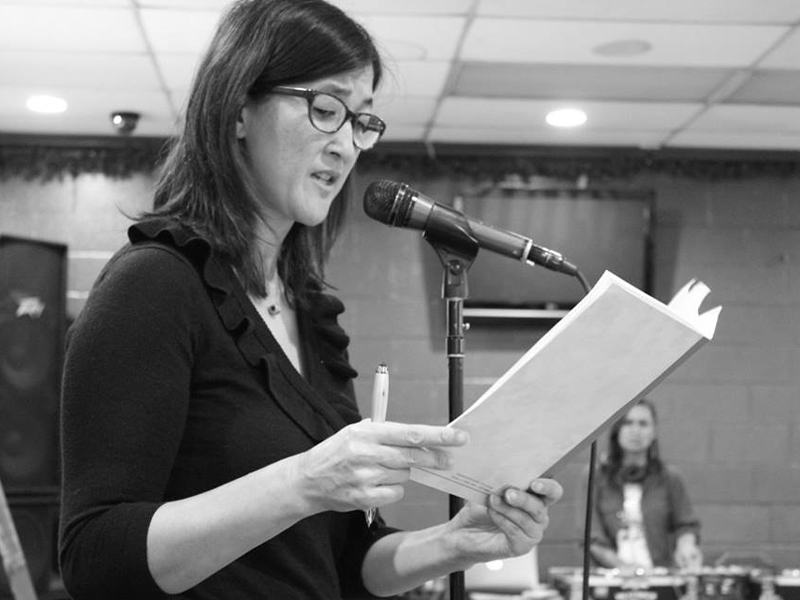 Patricia Park read from her novel, Re Jane, set in the disparate worlds of Queens, Brooklyn, and Seoul during the early 2000s. In the novel, Jane Re, a Korean American woman (and orphan), lives with her aunt and uncle in Queens, and feels like an outsider. Park’s animated talk provided glimpses of her own background in Flushing, Queens and described some of the difficulties in getting her novel onto the TV screen. Actor and producer Daniel Dae Kim is adapting the book as a half-hour comedy series. For the past five years we have been operating as an all-volunteer organization. We rely totally on all the volunteers, donors, sponsors, and kind artists who support us with their valuable time and talents. We are so grateful! And especially thankful to Poets & Writers for their financial backing of writers and events such as ours. 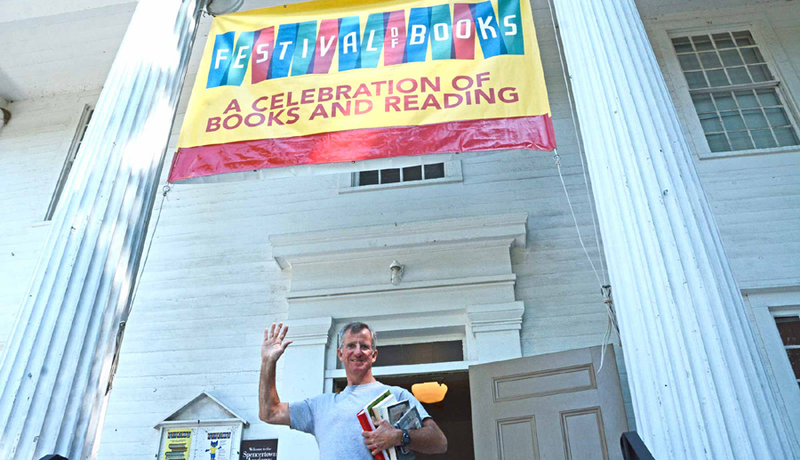 Photo: Spencertown Academy Arts Center’s Festival of Books (Credit: Peter Blandori).